London /Photography News/ — A Spanish photographer was stripped of a major wildlife prize Wednesday after organisers in London said it was likely that the apparently wild wolf featured in his entry picture was tame. 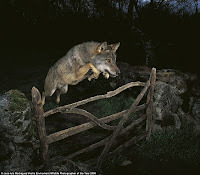 The winning image - "The Storybook Wolf" - was taken by photographer Jose Luis Rodriguez, who said he did nothing wrong, claiming to have captured the bloodthirsty Iberian wolf hurdling a fence in the wild after a daring trip under the cover of darkness. But the Wildlife Photographer of the Year judges said the wolf's markings showed it was actually a tame animal from a zoo near Madrid in Spain. It is against the competition rules to photograph a tame animal. "It saddens us to confirm that after a careful and thorough investigation into the image, The Storybook Wolf, the co-owners of the Wildlife Photographer of the Year competition, the Natural History Museum and BBC Worldwide have disqualified the winning entry of the photographer José Luis Rodriguez," said Louise Emerson, from the Wildlife Photographer of the Year competition office. The 10,000-pound prize was never awarded to the photographer although he did receive 500 pounds for winning his category, which organisers said they had agreed he could keep in lieu of royalty payments. As a result of his disqualification, there will be no 2009 winner. No Wildlife Photographer of the Year for 2009??? There were so many other great entries: the winning photo of the Nature Black and White award, or the one showing a cat squaring up to a fox three times her size... these made it to the top too. Why did the jury decide there will be no 2009 winner and didn't pass the award to one of the other top photographers instead? Really it is a nice blog, I would like to tell you that you have given me much knowledge about it. Thanks for everything. 6 comments so far. What do you think?